It has been a busy week in the House. Washington State Patrol recruitment and retention, marijuana, aerospace, education, workers' compensation, firearms, vaping, public safety and mental health are just a sampling of the issues discussed in House committees the last five days. While we will consider hundreds of pieces of legislation this year, House Republicans are focused on four priorities: providing students with a world-class education; empowering families and strengthening communities; protecting taxpayers and holding government accountable; and safeguarding neighborhoods. You can learn more about our priorities here. When it comes to holding government accountable and safeguarding neighborhoods, we share your concerns about the early release of more than 3,200 prisoners by Governor Inslee's Department of Corrections. This is unacceptable and those responsible must be held accountable. Unfortunately, there are more questions than answers right now. If the governor wants transparency and all the facts to come out, he should welcome the Legislature's involvement. At the end of the day, we are both responsible for policies impacting public safety. If state lawmakers are going to propose a solution, they deserve to know the parameters of the problem as soon as possible. 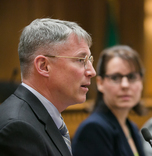 King County Superior Court Judge William Downing ruled I-1366 unconstitutional on Thursday. You can find my statement on this disappointing ruling here. This case now likely heads to the state Supreme Court. You'll be hearing more about this issue from us, including proposed legislation, in future e-newsletters. There are two issues I encourage you to learn more about below: saving our public charter schools and addressing the I-405 Express Toll Lanes controversy. I highlight these issues because both have bipartisan companion bills in the House and Senate. These solutions appear to be moving forward in the Senate, but their outcomes are less certain in the House. The state Supreme Court ruled our voter-approved public charter schools unconstitutional last September. Since then, we've been working in bipartisan fashion to find a solution. We now have that solution in bill form: House Bill 2367. Its companion, Senate Bill 6194, passed off the Senate floor on Wednesday with bipartisan support. Our K-12 education lead, Rep. Chad Magendanz (pictured in the AP Legislative Preview on January 7), explains the public charter school ruling and the bipartisan solution that would save these schools in this video. Take a look and let us know what you think. The embattled WSDOT launched I-405 Express Toll Lanes -- two each way between Bellevue and Bothell and one from Bothell to Lynnwood -- on September 27. Since then, a flood of complaints from commuters -- ranging from congestion, to traffic safety and technical glitches with paying the tolls -- have been directed toward the agency and state lawmakers. Rep. Mark Harmsworth, our new assistant ranking Republican on the House Transportation Committee, has offered a solution. House Bill 2312, which has bipartisan support, would require WSDOT to use only one Express Toll Lane each way throughout the corridor and open all lanes to unrestricted use not subject to tolls between 7 p.m. and 5 a.m. and on state holidays. The legislation would also move away from designated entry and exit points, and would instead allow continuous access except in specific locations where vehicles should not cross for safety reasons. Despite a petition with more than 28,000 signatures asking the Legislature to make changes to the I-405 Express Toll Lanes, the chair of the House Transportation Committee has not scheduled a public hearing on the bill. Rep. Harmsworth's bill has a companion in the Senate. Senate Bill 6152, which also has bipartisan support, received a public hearing on January 14.